Photo tours of Pete Nelson's treehouses from Season 11 of Treehouse Masters on Animal Planet. We took luxury box seating to the trees for Antonio Brown of the Pittsburgh Steelers! Its two stories, wall of windows, crow's nest, and sub-level bar all overlook a basketball court and football field. Amenities like the jacuzzi shower, wet bar, and TV viewing room add a posh touch, while tons of steel work pays homage to Pittsburgh. 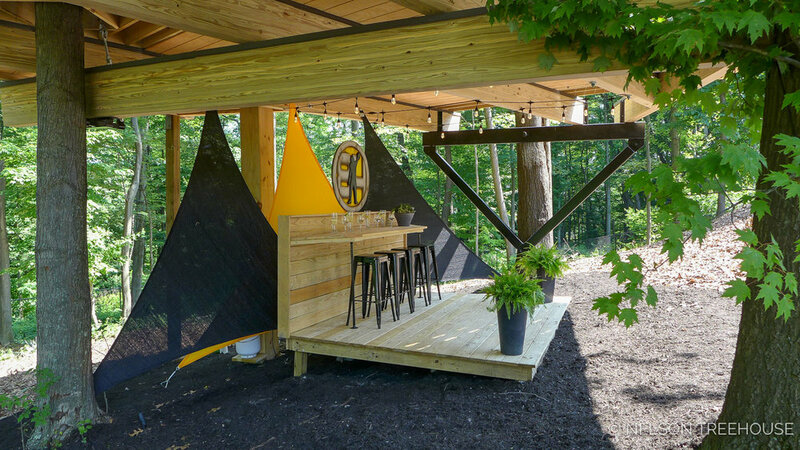 Antonio's treehouse is built for play and relaxation. Antonio's treehouse roosts in one maple and several oak trees. At the back, a wood post provides additional support. A football field and basketball court stretch out in front of the treetop box. This treehouse is bursting with steel: steel spiral staircases, steel railing, even stamped steel shingles on the roof. 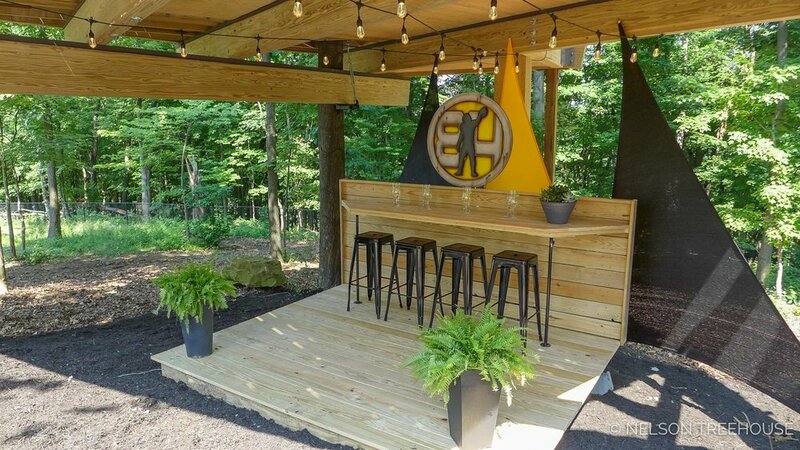 After all, what's a treehouse for a Pittsburgh Steeler without tons of steel?! Local steel union workers installed the framing for the window wall and skyscraper workers placed the glass. The space beneath the platform goes to good use as a bar. An enormous steel yoke provides platform support. A spiral staircase leads up to the deck. Another staircase winds up to the crow's nest, which has sweeping views of the football field and basketball court. Four skylights and the expansive walls of windows let in tons of natural light. 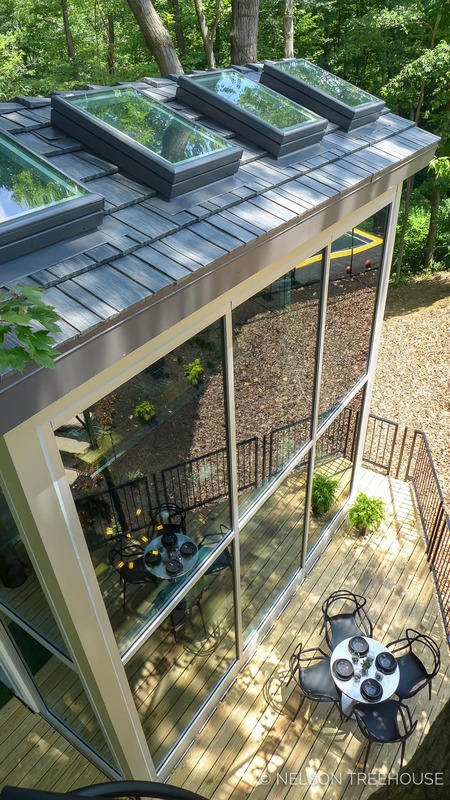 Carpenter Seanix Zenobia says: "The glass units on the [window] wall were about 400 pounds each, so it took four guys to bring one to the deck and then we used a motorized swiveling suction machine and rope rigging to lift them into place. That day was soooo much fun." The first floor is the ideal game viewing room, replete with a massage chair, wet bar, and sofa. Antonio can go between watching games on TV and on the fields outside. The crew made this wood beam mimic a steel I-beam. Most of the interior painting was done by the eminent Jason Hulfish. Real steel I-beams run beneath the loft. This built-in shelving unit swings open to reveal the bathroom/steam room. A luxe jacuzzi shower rounds out this modern bathroom. 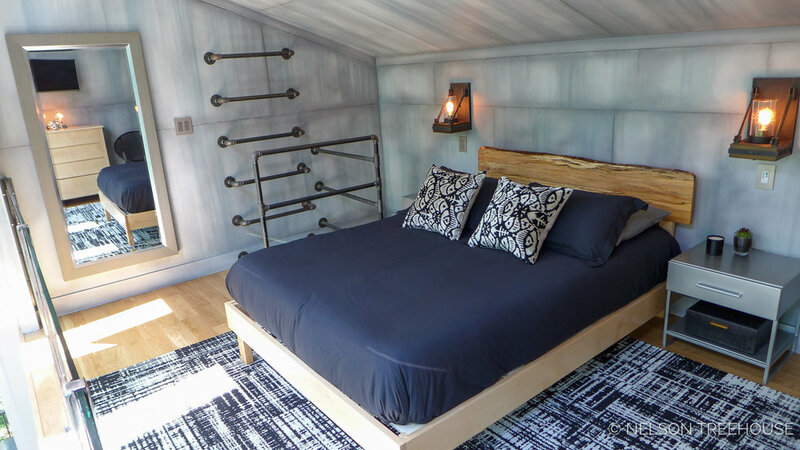 Metal bars form a ladder to the loft. The sleeping loft looks out to the canopy. At its highest point, the treehouse rises 20 feet off the ground. It was so fun to build Antonio's treetop luxury box! We wish him many good times up in the trees. Thanks, Antonio, for a fun and memorable build! What's your favorite part of Antonio's treehouse? Let us know in the comments below. Stay tuned for our photo tours each weekend from Season 11 of Treehouse Masters. Nelson Treehouse is the voice of nelsontreehouse.com, the source for all things in the Nelson Treehouse world. Home of all things Nelson Treehouse: find information here on Pete Nelson and the Treehouse Masters, building treehouses with Nelson Treehouse and Supply, treehouse hardware, and TreeHouse Point. Join Nelson Treehouse’s email newsletter list to receive the occasional “tree-mail” with updates, special offers, and treehouse inspiration. Nelson Treehouse will use the information you provide on this form to be in touch with you and to provide updates and marketing via email. You can change your mind at any time by clicking the unsubscribe link in the footer of any email you receive from us, or by contacting us at info@nelsontreehouseandsupply.com. We will treat your information with respect.